Microsoft Outlook is the most common corporate tool I come across in my work and is an ideal application to help you manage your busy life particularly in the workplace. While most Outlook users feel very comfortable in email and calendar, on average only around 10% ever use it to manage their next actions. This is a shame given that Outlook is actually a pretty good task management tool. In this section, we’ll show you how to configure and use it for managing your to do list. Like the other system guides, this video is not designed to be a full user manual, but simply a brief tour of it’s functionality which will hopefully help you get started. In particular, we will focus on how you can configure it to match the Ease the Load approach. For much of the article, we will focus on Outlook 2016 (the client with Office 365), but most of this material is just as applicable in other versions including 2010 and 2013. You should note that this is not the same as Office 365 web-based version (previously Outlook Web Access) The web version can manage your tasks but while at a glance it looks similar, it does have significant underlying differences in the interface. If you only have OWA, it’s probably still worth following this guide since it shares the same basic principles, but don’t expect to be able to exactly copy these instructions. When you launch Outlook, you should see the following four options in the lower the left hand navigation pane: Mail, Calendar, People and Tasks. If you can’t see Tasks, click on the little down arrow below this area and you will see you can add or take away various options. The first thing we want to do, is view our tasks by Category. On the home tab, change the current view to “Active”. Then on the view tab and change the arrangement from “due date” to “categories”. You may not yet have any categories set up, so we will want to create a few Categories or Contexts to match the approach we described earlier in the Ease the Load course. There are a number of ways to do this depending on your Outlook version, but the method that works for everyone is to open a new task. Then from the top menu, click on the Categorize button and select “All Categories” from the bottom. For this screen you will want to add, Waiting For, Someday/Maybe, Projects and probably something like @Computer, @Phone, @Agenda and so on. Don’t worry that you have to get this perfect first time. You can add, edit and delete them as you go. 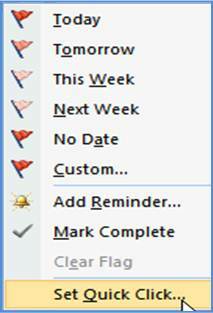 You can give each task a colour; colours don’t play a large part in Outlook Tasks, but they can do in the Calendar where appointments are colour coded. This might prove overkill for most people, but as Outlook allows you to link tasks to multiple categories, you could create a set of categories for “Context” and another set for “Projects” so for example you could add a task, Collect report from desk and link that to your @Office context and also your project “Office Move”. I think this is overcomplicating it, but I wanted to mention it for those who are delving deeper. If you decide to use OneNote with Outlook, you will find OneNote better to link your tasks to projects. Like most of these systems, including paper-based planners, there will be fields you just don’t need to use. It can become so complicated that it too much time to maintain, so my general advice in all of these systems is keep it simple – especially at first. 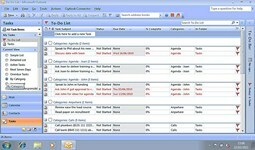 Now you have set up the contexts you can start to add your tasks. So let’s add a task that we need to do when we are in the office – Speak to Jo about the budget. If you did want to use these other fields, let me talk you through them. The subject line is the key task title of course, and there are a couple of options regarding dates. The start date is different from the due date. If you assign a start date, you will then have to provide a due date, though you can assign it a due date without a start date. A word of warning, I would very much advise against giving a due date unless there really is a deadline. We often find people arbitrarily giving a task a due date even though if doesn’t really have one. Once a due date has passed, in Microsoft Outlook, the task will then turn red and frankly, there is nothing more guaranteed to turn you off looking at your system than seeing a long list of red items. And we really need to stay engaged with our list, otherwise we will revert to keeping it all in our head – back to square one! So don’t provide one unless it truly has a deadline. You can choose a priority if you want, with low, normal and high. You can also set a reminder for a particular day and time. You can also give your task a status and a percentage complete, though you don’t have to and my experience is that this can often add too much structure. Don’t feel you have to fill in all these fields. For example, the details tab includes other options including total hours work and actual hours worked and while this can be useful for some, for example those who are involved in client billable work, it tends to be unnecessary for most of us. The one thing you will now want to do is give the task a category. So we will assign this to the “Office” category or context since we need to be in the office to speak to Jo. We can also attach a file, for example if it’s a document we have to review to complete the task. And that’s pretty much all that’s needed to add your tasks. To view your tasks, you can filter down by context so that Outlook only shows you the tasks you can do when you are in a particular context. To do this, right click on one of the groups and click “Collapse All Groups”. So now when you are in the office or at the computer, you can focus and only see the tasks you can do in this context. If you remember we have also spoken about changing the context of a task and this is certainly easier to do in an electronic system. For example, you have a task to ask John if he got approval to run the training. Once you have done this, he might say he will need to get back to you about it. Using the approach we have described earlier this now becomes a “waiting for”. 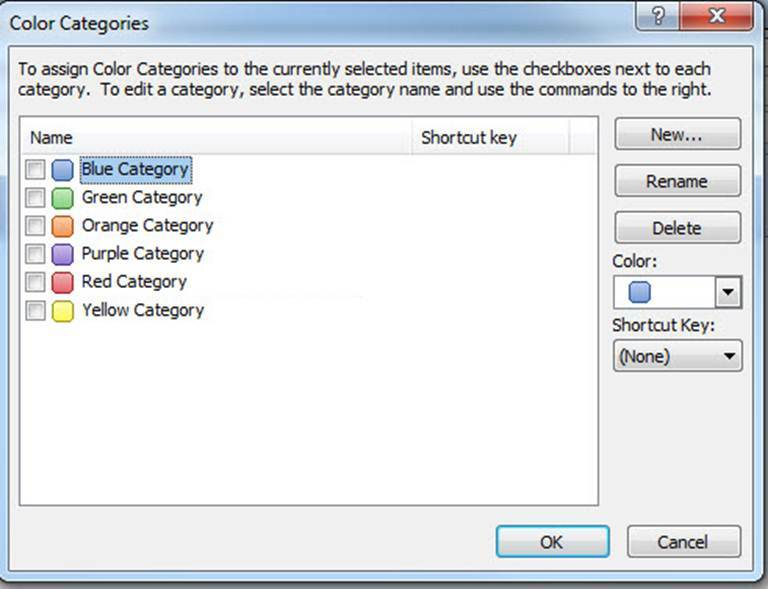 Rather than having to rewrite the task, you could right click the category and change it appropriately, but the easiest way is probably to simply drag the task to the new category. The same might go for a someday/maybe. You will remember from the Workflow process that this context is designed to catch anything we aren’t ready to commit to just yet, but is a good idea we don’t want to lose. So you might decide that the idea to go on a cruise should now become a project, you can change its category from a someday/maybe to a project. This is where the weekly review becomes a much more structured planning activity. As part of the weekly review, you quickly scan through the Waiting For list and see that John is still to get back to you, so you can send him a quick reminder. You also scan through the Someday/Maybe list during the review and allow some of these great ideas you are incubating to become projects. During the weekly review you will also look through your Projects lists and this will help you keep these bigger pieces of work on track. If many of your tasks are driven by e-mail, you can quickly make an e-mail into a task or meeting. To do this, drag the e-mail over to the task button on the navigation menu and let go. 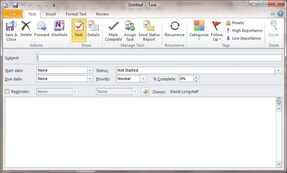 Now a task is automatically created with the subject of the e-mail now becoming the subject of the task. Any message that was in the body of the e-mail is also copied across. The same can be done with a calendar item. Obviously if it is someone within the team they will likely send you a calendar invitation to organize a meeting, but if it’s from someone external to the organization, it will more likely be just an e-mail so drag this across to the calendar button on the navigation bar and this will automatically create an appointment and you can change the date and time appropriately. There are other ways to create tasks, and recent version of Outlook included flagging e-mails; however for various reasons we generally advise using the method we’ve described in this video. For those who use a mix of paper and electronic, you can easily print your list out – if you select print and then choose the table view, this will print your list of tasks as you normally see them. 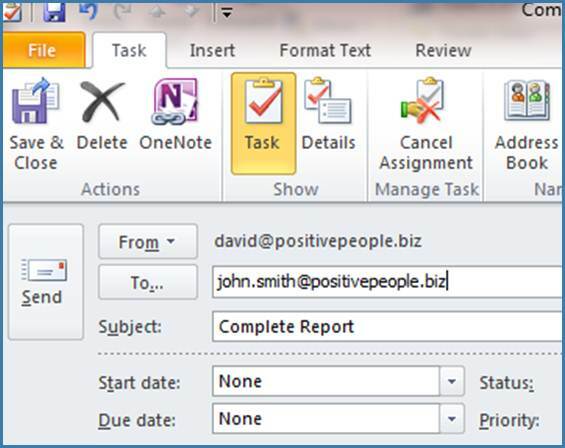 Just as an aside, if as a team you decide to use Microsoft Outlook to manage group tasks, you’ll see that you can give a task to someone else. To do this, click on the “Assign Task” button and send it to them in the same way you would send an e-mail. However, there are sensitivities around this and you would want to agree this approach as a team before implementing it. There are a number of ways to synchronise Outlook with a variety of devices such as iPhone, Blackberry and Windows Mobile but they are likely to be very different from organization to organization since corporate policies sometimes block the use of mobile devices. You will want to check the options available to you with your IT administrator. Outlook is a very effective corporate tool, and has much more functionality than we can describe in this brief video. However, if this tour has made you feel that you don’t use it as much as you should, it would be well worth taking the time to familiarize yourself with its other functions. There are plenty of good YouTube videos, books and training courses available. Hopefully however, this has given you enough information to help you customize the tasks function within the application to use the approach we have described in the Ease the Load course. Started to use tasks and have a fair few built up now within Outlook, couldn’t work out how to achieve white space in my inbox. I will have a clear out next week and send more stuff to my archive. I will have to watch the videos again and again as they raise questions which I cant answer such as, if an email is dragged into a task does the mail also stay in the inbox and if so if the mail is archived does it disappear from task. I’ve probably missed the point with this hence watching again. I like the idea of quick steps and will block out time to think through what recurring tasks could benefit from this. I also need to work out a strategy of structuring my day within callender as I’m still fire fighting email tasks as they come in at the same time as trying to deal with projects, so most days are still a bit chaotic.